The Canola Performance Trials (CPT) online database at canolaperformancetrials.ca is updated to include the 2017 small plot and field scale CPT dataset. So now, when you run queries on the CPT database, 2017 data can be included in your single or multi-year searches. 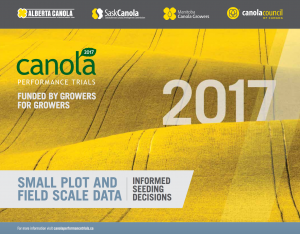 2017 Canola Performance Trial (CPT) small plot and field scale data booklet is now available.